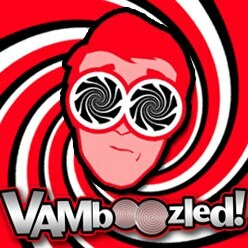 December | 2016 | VAMboozled! Following-up on two prior posts about potential bias in teachers’ observations (see prior posts here and here), another research study was recently released evidencing, again, that the evaluation ratings derived via observations of teachers in practice are indeed related to (and potentially biased by) teachers’ demographic characteristics. The study also evidenced that teachers representing racial and ethnic minority background might be more likely than others to not only receive lower relatively scores but also be more likely identified for possible dismissal as a result of their relatively lower evaluation scores. The Regional Educational Laboratory (REL) authored and U.S. Department of Education (Institute of Education Sciences) sponsored study titled “Teacher Demographics and Evaluation: A Descriptive Study in a Large Urban District” can be found here, and a condensed version of the study can be found here. Interestingly, the study was commissioned by district leaders who were already concerned about what they believed to be occurring in this regard, but for which they had no hard evidence… until the completion of this study. In all three years the percentage of teachers who were rated below proficient was higher among Black teachers than among White teachers, although the gap was smaller in 2013/14 and 2014/15. In all three years the percentage of teachers with a summative performance rating who were rated below proficient was higher among teachers age 50 and older than among teachers younger than age 50. In all three years the difference in the percentage of male and female teachers with a summative performance rating who were rated below proficient was approximately 5 percentage points or less. comparisons did not vary by race/ethnicity, age, or gender. This is certainly something to (still) keep in consideration, especially when teachers are rewarded (e.g., via merit pay) or penalized (e.g., vie performance improvement plans or plans for dismissal). Basing these or other high-stakes decisions on not only subjective but also likely biased observational data (see, again, other studies evidencing that this is happening here and here), is not only unwise, it’s also possibly prejudiced. ameliorating them,” for starters and at minimum, those conducting these observations literally across the country must be made aware. Last spring, Eduardo Porter – writer of the Economic Scene column for The New York Times – wrote an excellent article, from an economics perspective, about that which is happening with our current obsession in educational policy with “Grading Teachers by the Test” (see also my prior post about this article here; although you should give the article a full read; it’s well worth it). In short, though, Porter wrote about what economist’s often refer to as Goodhart’s Law, which states that “when a measure becomes the target, it can no longer be used as the measure.” This occurs given the great (e.g., high-stakes) value (mis)placed on any measure, and the distortion (i.e., in terms of artificial inflation or deflation, depending on the desired direction of the measure) that often-to-always comes about as a result. 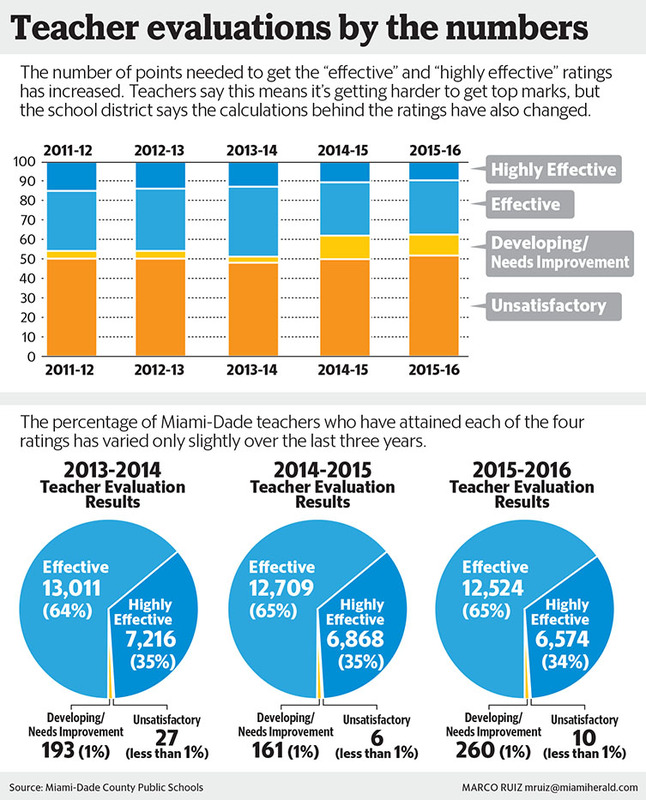 Well, it’s happened again, this time in Miami-Dade, Florida, where the Miami-Dade district’s teachers are saying its now “getting harder to get a good evaluation” (see the full article here). Apparently, teachers evaluation scores, from last to this year, are being “dragged down,” primarily given teachers’ students’ performances on tests (as well as tests of subject areas that and students whom they do not teach). 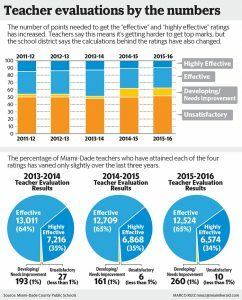 As per the figure also included in this article, see the illustration of how this is occurring below; that is, how it is becoming more difficult for teachers to get “good” overall evaluation scores but also, and more importantly, how it is becoming more common for districts to simply set different cut scores to artificially increase teachers’ overall evaluation scores. This, as mentioned prior, is something called “artificial deflation,” whereas the quality of teaching is likely not changing nearly to the extent the data might illustrate it is. Rather, what is happening behind the scenes (e.g., the manipulation of cut scores) is giving the impression that indeed the overall teacher system is in fact becoming better, more rigorous, aligning with policymakers’ “higher standards,” etc). This is something in the educational policy arena that we also call “symbolic policies,” whereas nothing really instrumental or material is happening, and everything else is a facade, concealing a less pleasant or creditable reality that nothing, in fact, has changed. Ohio Rejects Subpar VAM, for Another VAM Arguably Less Subpar? From a prior post coming from Ohio (see here), you may recall that Ohio state legislators recently introduced a bill to review its state’s value-added model (VAM), especially as it pertains to the state’s use of their VAM (i.e., the Education Value-Added Assessment System (EVAAS); see more information about the use of this model in Ohio here). As per an article published last week in The Columbus Dispatch, the Ohio Department of Education (ODE) apparently rejected a proposal made by the state’s pro-charter school Ohio Coalition for Quality Education and the state’s largest online charter school, all of whom wanted to add (or replace) this state’s VAM with another, unnamed “Similar Students” measure (which could be the Student Growth Percentiles model discussed prior on this blog, for example, here, here, and here) used in California. The models, again if I am correct, are very much the same. While indeed the California measurement might in fact consider “student demographics such as poverty, mobility, disability and limited-English learners,” this model (if I am correct on the model) does not statistically factor these variables out. If anything, the state’s EVAAS system does, even though EVAAS modelers claim they do not do this, by statistically controlling for students’ prior performance, which (unfortunately) has these demographics already built into them. In essence, they are already doing the same thing they now protest. Indeed, as per a statement made by Ron Adler, president of the Ohio Coalition for Quality Education, not only is it “disappointing that ODE spends so much time denying that poverty and mobility of students impedes their ability to generate academic performance…they [continue to] remain absolutely silent about the state’s broken report card and continually defend their value-added model that offers no transparency and creates wild swings for schools across Ohio” (i.e., the EVAAS system, although in all fairness all VAMs and the SGP yield the “wild swings’ noted). See, for example, here. What might be worse, though, is that the ODE apparently found that, depending on the variables used in the California model, it produced different results. Guess what! All VAMs, depending on the variables used, produce different results. In fact, using the same data and different VAMs for the same teachers at the same time also produce (in some cases grossly) different results. The bottom line here is if any thinks that any VAM is yielding estimates from which valid or “true” statements can be made are fooling themselves.